This morning LinkToChina welcome a visit from the Chinese Ministry of Commerce and six of its provincial chapters. 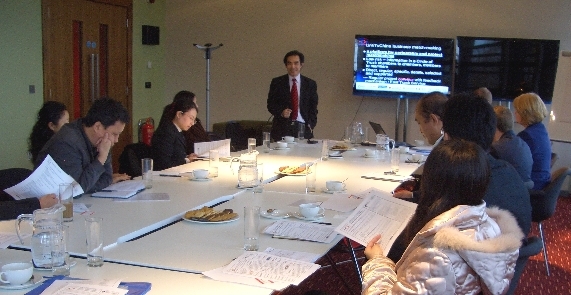 Officials from Guangdong, Shanxi, Inner Mongolia, Hubei, Yunnan, Tianjin and the Chinese central bank, The Peoples’ Bank of China, listened to a number of briefings provided by LinkToChina, Thames Valley Chamber of Commerce Group, and Wilkins Kennedy. The briefings covered the UK economy, chambers’ services and the UK-China business matchmaking services as well as those of its strategic partners. Dr. Kegang Wu, Executive Director of LinkToChina, Christina Howell and Paul Britton, respective Head and Deputy Head of Thames Valley Chamber’s External Liaison, and Linda Penny, Partner of Wilkins Kennedy discussed with the delegates the opportunities in the UK for Chinese investors and those in China for UK exporters. A number of UK proposals from UK companies were tabled at the meeting. Ms Hou Yi, representing the group, thanked the British Chambers of Commerce, LinkToChina, and Thames Valley Chamber of Commerce, expressing a keen interest to work closer together with chambers and LinkToChina in the future. This entry was posted in British projects, China Events, Chinese investment and tagged british chambers of commerce, Christina Howell, 英国商会, 英国投资, 英中企业对接项目, Kegang Wu, LinkToChina, Ministry of Commerce, Paul Britton, Thames Valley Chamber of Commerce, Wilkins Kennedy, 吴克刚, 商务部, 泰晤士河商会. Bookmark the permalink.